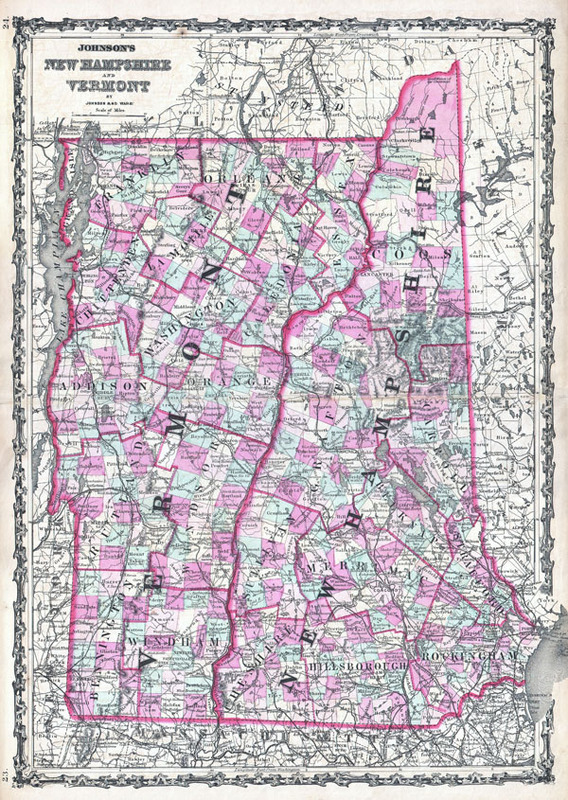 A beautiful example of A. J. Johnson's 1862 map of Vermont and New Hampshire. This rare map offers a fascinating snapshot of these two New England states shortly following the outbreak of the American Civil War. Map shows both states in full with bold and dramatic color coding according to county and district. Features the strapwork style border common to Johnson's atlas work from 1860 to 1863. Published by A. J. Johnson and Ward as plate numbers 23 and 24 in the 1862 edition of Johnson's New Illustrated Family Atlas. Rumsey 2905.011 (1860 edition). Phillips (Atlases) 6140, 16-17.